Instead of following this guide you can also use this app to generate a prepopulated form URL https://prepopulate.jotform.io/. View your form's source to identify each form field name you wish to be prepopulated. 1. Click the "Preview" button. 2. Click the "OPEN IN NEW TAB" button. 3. 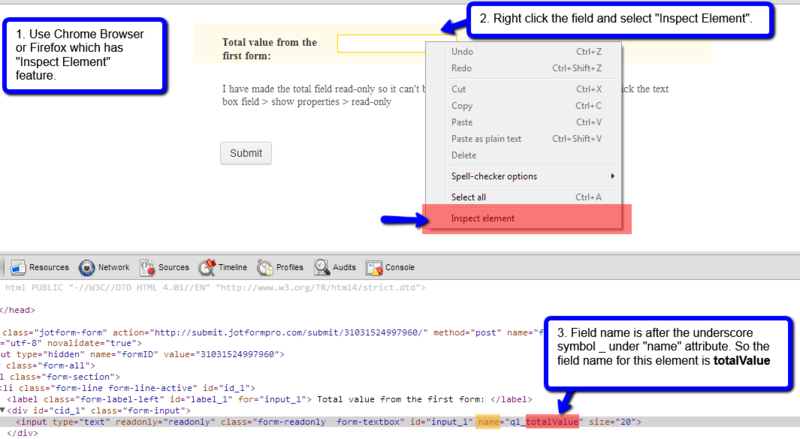 Right click on the live form then click "View Page Source" or "Inspect"
Or you can use Browser Inspect Element feature so you can easily identify field names. Check this screenshot. Now we're able to get the names of each field, include them in the URL, remember to put a question mark "?" after the URL to declare that we are submitting parameters, then comes the name followed by equal sign "=", then the value. If you wish to add more parameters, these are to be separated by "&" sign. 1. First, find the value of its name attribute in the HTML source code. 2. Copy the name after the underscore symbol "_" e.g pleaseChoose but remove the "" on it. To be able to select more than one, you need to separate each value with a comma. If you have questions about this guide, feel free to leave your comments below. Just testing this feature but having some issues. But nothing happens - In edge is removes the parameters from the URL altogether. Also can we make that field read only so only the parameter can populate it? I also want to prevent submitting the form unless that field has a value so we don't get random rubbish. This information is very close to a feature that we have been seeking. We need to be able to create the url and assign unique values for just one field like ID. And then be able to provide unique urls to different subscribers who will use their assigned url to share the form with others. In such cases, the data as it is collected must contain the unique ID that refers to which of our members produced the results of the form. Does your example accomplish this? Thanks. will this work if the form is embedded on another site? can i use this prepopulate feature for appointment slot widget, want to get a link with already selected to a slot.? This is great for how to display the desired data. Please direct me to help on how to locate the desired data. **How can the form look for Person A fields (project name, time for project, cost of project) by looking up Person A on the report from another form? Hi, I am trying to pre-populate a name field between two forms, but I have an issue where the First Name, Initial, and Last Name from the first form are being pre-populated altogether into the First Name field of the second form. How should I write the link to get it to pre-populate the name field correctly? Hello, how do I add facebook messenger link from the word Messenger? If someone had clicked the link will automatically directing to messenger. Hi could you take a look to see if I am doing this correctly. I got it working a while ago, but for some reason, its not working anymore. Hi, I am trying to connect two forms. Form 1 is for my CLIENT, Form 2 is for my client's CUSTOMERS. Basically my client fills out Form 1... and then the autoresponder email would send to the CUSTOMER, with a custom link to FORM 2 -> and pass the data from Form 1. I have a very simple setup, yet the data is not passing, so I am definitely doing something wrong. All examples for multiple choice (checkbox) and dropdown work with predefined values. If control does not have values defined, I was not able to set them with my values via URL. For checkbox or dropdown controls is it possible to define values via URL? Can I embed an HTML report from jotform and pull the data from one specific column into a dropbox field that is on my new form which the user is able to choose from that particulater list? Hi. How does this method sit with GDPR? It looks like we would be sending a clear string of data to URL? What if those strings were - name, phone and email? Would this work with pre populating fields from Volusion? It would be really awesome of some information was able to pull from my store. File could not be uploaded for some reason. Can forms embedded thru JS or iFrame also be prepopulated? if so, how can I do that? This time it does not work (i.e. the form comes up with pre-populated fields, but not with the desired content). In fact, the form comes up with Mickey Mouse, Disney Specialist (how it was set the first time). So how do you do this with a jotform embedded on your own website? this is all working fine but I was curious if I could pre-populate the shift (hour) field by incrementing the previously filled value. for example, when they submit the form with "5:00 pm - 6:00 pm" selected from the drop-down, I would like for the hours section on the next form to be filled with the next item in the drop-down menu ie "6:00 pm - 7:00 pm"
I went into the source code as per your example. However, those codes did not come up on my form. I've located the field for prepopulating the email address as the linking field between the first form and the second form. However, the question remains as to how to use it. I'm guessing that it would be a hidden and prepopulated field on the second form. TESTING MY FORM: I'm trying to test my form. I'm at a point of verifying my email address. I've been sent the verification code. I enter it. And then it doesn't move forward. I've gone back in to turn off the only 1 submission and set it to NO CHECK. I just went in to clear my cache. I'll close JotForm and try again. I'm going to turn off the Use Verification Code and that will probably make a difference. However, ideally, I would like to have the email verified. But again, optimally, I would really like to be able to send them a verification code. It's so easy to do that, but naturally, the feature needs to work properly. Thanks for your help on this matter. It is definitely helping me to make a lot of progress quickly. While I'm at it, do you have tutorials on using your widgets? Thank you tons, tons, TONS !!! I have a problem prepoluting a form. But the URLD doesn't work well. I want to send an email from MailChimp and prepopulate the jotform fields. 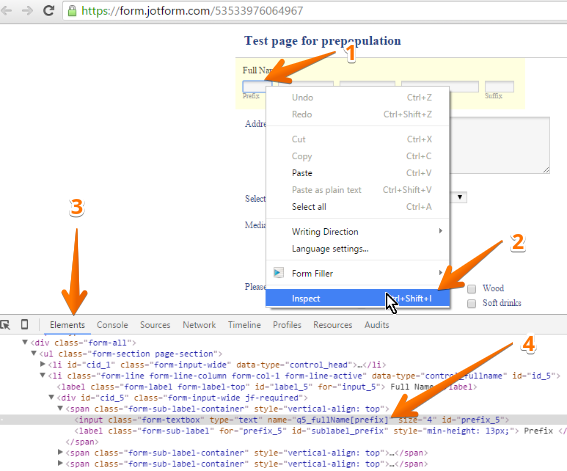 However, I want them to go to an embedded version of the form (on my website) rather than the jotform site. Is this possible? Can we create query string for the widget field(US states or country)? Would be good if you could "get a pre-filled link" in the same way that google forms does, This way I could fill out certain information needed for each of my clients in the form but save them the trouble of doing so themselves. Or to fill in information already given to me in previous contact via e-mail etc. Unfortunately the form prepopulates the radiobutton with value "2" instead of the radiobutton with value "0,2". Using a dot in the number is also no solution because this form should be used in an area where commas are used to separate numbers. is there a way to have the prepopulated data encrypted so that people filling in the forms cannot spoof data? how will i put "+", tried %2B but not working. This is great, can I generate QR codes from jotform with these parameters refilled out, or do i need to do that outside of jotform? I noticed that the recurring payments name is defined differently than the other elements within an Authorize.net widget. However, when I try to pass the parameter for number of recurring payments with the name of the dropdown defined as "custom_recurringtimes" I would need to drop the custom_ and only use "recurringtimes" and set the value some number. That does not work. I believe that the script that interprets the url parameters does not currently handle "custom_" prefixes. Can you please help? Also if it's possible can you let me know if there is a workaround. I want to specify number of payments via url parameter so that the user cannot change. Forget my previous comment. I am not sure what I did different, probably a spelling error. But it's working now! I am trying to run 2 pre-fill selections at the same time. One selection is to select the name of a person. The second is to select the price (paypal plugin). I can get them to run separately, but not together. they just won't run together. I have also tried separating them with the "&" sign and still the same result. I will go over the documentation again. What do you think is the problem. Can a ticket location field from Ticketmaster or StubHub, with one click from those websites, pre-populate into a JotForm? Please can you help, I have one field "Type of hood Cover" which no matter what I try will not prepopulate my "Duplicate Form". No matter what I try this will not work. Am I right to assume that if a field box changes at all, then the code for preopulating will not work unless completely re=written? It should transfer to this, when "Duplicate Quote" is selected prior to submit. I would like to repopulate a drop down field from a google spreadsheet. The form would need to get 20 or so single names into a single name Drop Down field, our therapist then would chose the client from the drop down for billing. The google sheet is filtered and sorted. I am attempting to pre-populate fields on this form: https://form.jotformpro.com/72183998729981. I need to pre-populate the radio buttons for different courses. Is it the collapse function that I'm using that's breaking the pre-populate links, or the long field values with spaces and other punctuation? Can you also pass an image to the form? How to use in editing the form? Aury has been looking at this also. How do I prepopulate an email input if it doesn't contain a name attribute? All I see available are id, placeholder, size and type. Please help. Is it possible to revisit a previous prepopulated form and change the values? If so will these change for everyone with the current link or would a new link need to be generated? Ability to pre-populate dropdown and check box options from an external source such as a database. How to prepopulate checkbox label?